Where I got it: I bought it. Why I read it: It's written by Noam Chomsky! Noam Chomsky gave a talk via satellite three years ago at my university. I didn't go because I'd made plans to see some crappy blockbuster at the cinema with my friend. Man was I an idiot! If Noam Chomsky is giving a talk, you skip the cinema. You skip anything. Why? The man is, quite simply, a legend. He's the worlds most famous living anarchist, the eighth most cited source of all time, the most quoted person alive as well as a hugely influential linguist. Noam Chomsky truly is amazing. 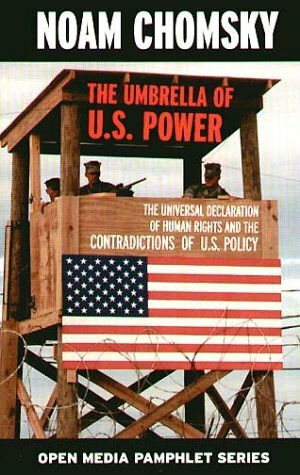 'The Umbrella of U.S. Power...' is just a drop in the ocean in his body of work, and one that is well worth reading. The book describes the USA's response to the Universal Declaration of Human Rights (UDHR). Chomsky aptly points out that publicly the USA is one of the most ardent supporters of UDHR as well as being one of the harshest critics of countries that violate it. However, what the USA says and what it actually does are two entirely different matters and what quickly becomes apparent is that the USA has an unbeaten track record for violating UDHR. Chomsky gives several excellent examples to back up all of his points and some of these really struck me. To give one example: In 1993, the New York Times reported that "At Vienna talks, U.S. insists Rights Must be Universal". However, the USA often both supports and funds governments who enforce the free market, support US. multinational corporations and expand the U.S. empire by committing genocide, torturing their citizens, stifling free press, overthrowing democratically elected leaders, etc. This has happened in countries like Nicaragua, Panama, Columbia, Chile, Iraq, Iran, East Timor, Haiti, and many others. Chomsky points out that "It is not that U.S. leaders prefer torture; rather, it has little weight in comparison with more important values". The hypocrisy of the USA stunned me. There are many fantastic things about the book. Firstly, it's a real eye-opener. I was sickened as well as incredibly angry by the information in this book. The depth of Chomsky's knowledge is also incredible. It is clearly and factually written. It contains no emotive language, it plainly describes the USA and UNHR. It's also very short- fifty-seven pages in total, which is great because one could read it entirely in a very short period of time. He makes some interesting observations that really make you think. I highly recommend it to everyone, especially anyone interested in human rights, politics, or who wants a deeper understanding of the world as it is today. I did a psychology degree so I know Chomsky more from the linguistics side, which is impressive enough. This book sounds really interesting. Have you read "A Problem from Hell" by Samantha Power? It's about genocide and America's reaction to it and it sounds like it has similar themes to this book. Hey Sam, Anna here. I have read 'A Problem from Hell' and you're right, it does have themes which are similiar to Chomsky's book. I think both books are particularly relevant now in light of the information released by Wikileaks about what happened in Iraq. I see on your blog that you're reading Pullman's 'The good man Jesus and the Scoundrel Christ', what do you think of it? Have you read any other of Pullman's books? Hey Anna. I've been thinking of reading some Chomsky for a while now, particularly 'Media Control' because of my interest in political journalism. I think I might check 'Umbrella' out from the library as soon as it's available.